Bore large diameter holes without burning - Enjoy speeds as slow as 250 RPM for large diameter multispurs, forstners, adjustable augers and hole saws without burning your workpiece or destroying the temper of your bits. Drill ferrous or non-ferrous metals - The low speeds provided by your PowerPro will also allow you to drill ferrous or non-ferrous metals safely without ruining the temper of your twist bits. Rout, shape and joint faster... with smoother results - The PowerPro's higher speeds (up to 10,000 RPM) will help you achieve the super-smooth cuts that you would expect from a commercial shaper, jointer or hand-held router... and do so more quickly. 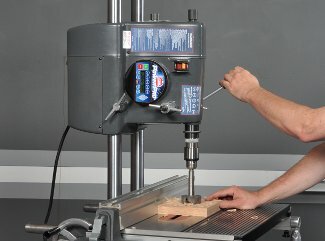 Perform safer under-workpiece shaping - The reversing function of your new PowerPro will allow you to install your Shaper cutters upside-down on their arbors... select reverse rotation on your Control Panel... and make your Shaping cuts on the underside of your stock, keeping your hands out of harm's way. Specialized reverse sanding - Other reversing functions include: • The removal of feathering on lathe turnings or the inside or outside edges of drum-sanded projects • Disc sand difficult-to-reach inside or outside project corners at the REAR of the Mark V worktable without flipping the workpiece.